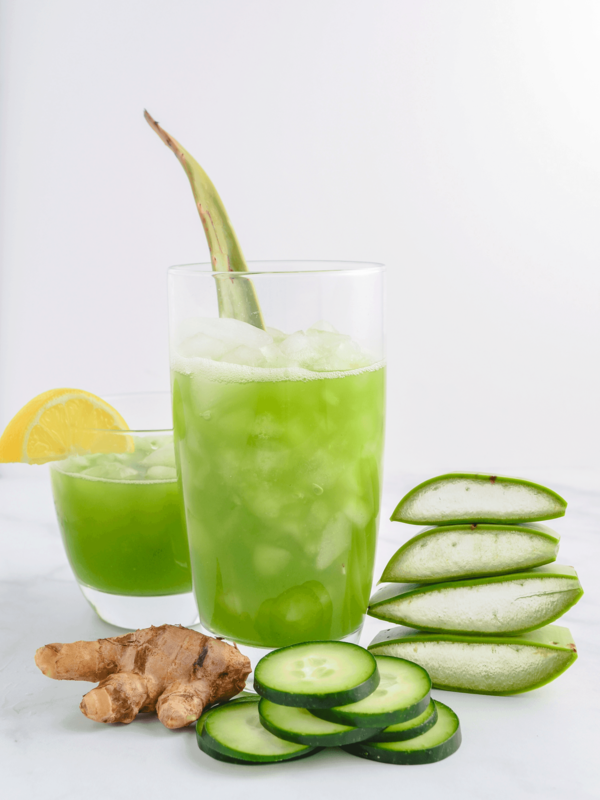 A refreshing, hydrating, and anti-aging Aloe Vera Juice Recipe with cucumber, lemon, and ginger. Aloe vera juice might be an up and coming health trend, but I think it’s more than just a fad – aloe juice is here to stay. For starters, it’s incredibly refreshing. Especially when you add cucumber juice into the mix! But aloe juice also provides some pretty awesome health benefits and it’s super hydrating since the gel consists of 99% water. Aloe vera juice is also much easier to make at home compared to other popular health drinks. All you need is a blender! That’s right. There’s no expensive juicer required, and best of all this aloe vera juice recipe is ready in under 10 minutes! If you want an even easier superfood juice then try out this spirulina mermaid lemonade! It’s ready in just 5 minutes and there’s no blending or juicing required. Wash and dry fresh produce. Cut ends off cucumbers then quarter them so they fit in a blender. Cut lemon in half. Peel ginger. Squeeze lemon juice into a blender (or peel the lemon and put it all in), add cucumbers, ginger, and water to the blender. Blend on high until mixture is completely broken down and liquefied. Strain the liquid through cheese cloth or a nut milk bag, squeezing to extract all of the juice. Discard the leftover pulp. Return the strained juice to the blender. Using a knife, cut along the sides of the aloe leaf to remove the spines. Cut along the face of the aloe vera leaf to remove the outer leaf and rind. This will expose the clear gel. Rinse off any yellow liquid that seeps out and cut off and discard any yellow tinted gel. Scoop out the clear aloe vera gel from the middle of the leaf. *Avoid the yellow tinted gel on the outsides closer to the rind. The yellow tinted gel is aloe vera latex which is a laxative – definitely not what we want in our refreshing and hydrating juice! Add the 2 tbsp of clear aloe vera gel to the blender with the cucumber, lemon, and ginger juice. Blend on low until the aloe vera gel has fully mixed and incorporated into the juice, about 20 seconds. Pour the fresh juice over ice and enjoy! Does Aloe Vera Juice Help Detoxify? If you want to drink aloe juice to detoxify your body, I’m afraid you might be disappointed – there’s no scientific evidence that supports aloe juice being detoxifying. The best way to detox is still to let our bodies do it naturally, drinking plenty of water and providing our bodies detox centers like the liver and kidneys with the nutrients they need to function at their best. When I feel like detoxing I go straight for a juice cleanse. This way I’m nourishing my body with an influx of nutrients, staying properly hydrated, and limiting my intake of toxins. I also find that a juice cleanse helps me to “reset”, getting rid of bad eating habits and helping me to crave healthier foods. Just make sure you know how to properly prep for a juice cleanse to get the most out of it! If you don’t have the time to juice yourself, try a juice cleanse that’s made for you by professionals! My personal favorite is the 3-day cleanse from Jus By Julie. Their juices are delicious, but they also keep the fiber in their juices unlike most companies. Fiber is extremely important for digestion and it helps to make sure the juices don’t spike your blood sugar! You can also try some homemade detox waters which will help to keep you properly hydrated. So if aloe juice isn’t exactly detoxifying, then what is it good for? Aloe vera has been used for centuries for its healing and soothing properties when applied topically, and it’s found in tons of modern skin care products. The benefits of using aloe vera on your skin are well studied and established, but consuming aloe vera orally is a rather new health trend. Drinking aloe vera juice can provide a variety of interesting health benefits, but can also be detrimental if the yellow latex (found on the edges where the aloe leaf and gel meet) is consumed. Did you try this aloe vera juice recipe? Let me know in the comments below what you think and be sure to leave a rating! A hydrating and nourishing aloe vera juice recipe with refreshing lemon, cucumber, and ginger! Strain the liquid through a cheese cloth or nut milk bag and squeeze to extract all of the juice. Discard the leftover pulp. Return the juice to the blender. Cut off and remove the spines along the side of the aloe leaf. Cut the face off the aloe leaf to reveal the aloe gel. Scoop out 2 tbsp of clear aloe gel, avoiding the yellow tinted gel that is closer to the leave’s surface. Add the aloe gel to the blender with the juice. Blend on a lower setting until the aloe gel has been thoroughly mixed into the juice, about 20 seconds. Be sure to only use the clear aloe vera gel found in the center of the leaf. The gel closer to the edges will be yellow tinted from the aloe latex, which is a laxative that should be avoided! Thanks for sharing this Kailey! I have been hearing a LOT about Aloe Vera juice. This looks pretty easy. I will give it a try! It’s super easy and so refreshing! I’m intrigued with the aloe!